Louie the dog has just had a bath – and he is NOT happy about it. He smells all wrong. Determined to get his Special Smell back, he goes on a hunt for it and meets lots of smelly things along the way – a fox, some interesting dustbins and a marvellously muddy puddle to roll in. Will he ever get his smell back? And, more importantly, will he be able to keep it this time …? Catherine Rayner is the Kate Greenaway Medal-winning creator of Solomon Crocodile and Ernest. 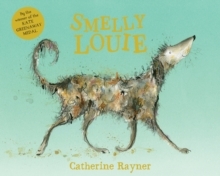 Smelly Louie is full of her trademark humour and richly textured artwork. Shortlisted for the Greenaway medal, this funny canine tale will be a sure-fire hit with children and adults alike.